Put berries, sugar and tea bags in a medium saucepan. Fill with enough water so it’s 1 inch above everything in the pot; about 2 cups. Bring to boil over high heat, lower heat and simmer for 30 minutes. Turn off heat, cover and let sit until room temperature. Store in the fridge for the week. Heat oil in a large pot or dutch oven over medium high heat. Add beef and cook until no longer pink. Add onions, poblanos and green peppers. Cook 5 minutes longer. Add garlic, chili powder, paprika, a sprinkle of salt and pepper. Cook 2 minutes longer. Add beer; bring to a boil. Cook until most of the liquid evaporates, about 15 minutes. Add salsa, chiles, tomatoes, and beans. Bring to boil, reduce heat to a simmer and cook 30 minutes to an hour. Salt and pepper to taste. Store in the fridge for the week. Heat olive oil in a saute pan over medium heat. Add fennel and a dash each of salt and pepper; saute until soft and carmelized, about 15 minutes. Store in the fridge for the week. Grind walnuts in a food processor until the size of bread crumbs. Pour into a bowl. Grind bread chunks in a food processor into even crumbs. Add to the walnuts and toss to blend. Store in the fridge for the week. Bring water and rind to a boil in a medium saucepan. Boil for 2 minutes and drain out the water. Pour sugar and juice into the pot with the rind; bring to a boil, stirring constantly until sugar dissolves. Reduce heat to low and simmer for 20 minutes. Remove from heat, pour into a bowl and chill for at least 2 hours in the fridge. Strain the juice mixture to remove all the solids, and add buttermilk and vodka. Stir to combine, freeze in an ice cream maker according to manufacturer’s instructions. Store in the freezer for the week. Heat water (or milk, or both) to boiling in a saucepan over high heat. Whisk in the cream of wheat, bring to boil; reduce heat to low and continue to whisk until thick and smooth, about 2 minutes. 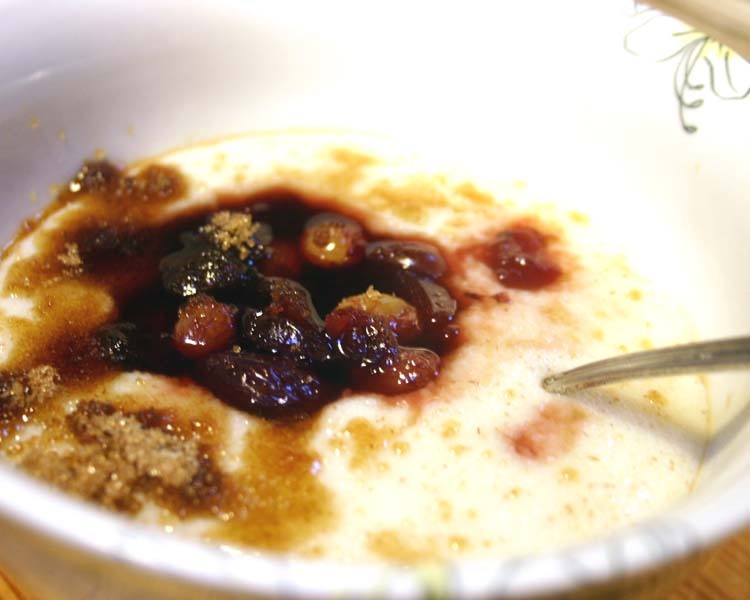 Divide between 2 bowls, top each with half of the chutney and a sprinkle of brown sugar. 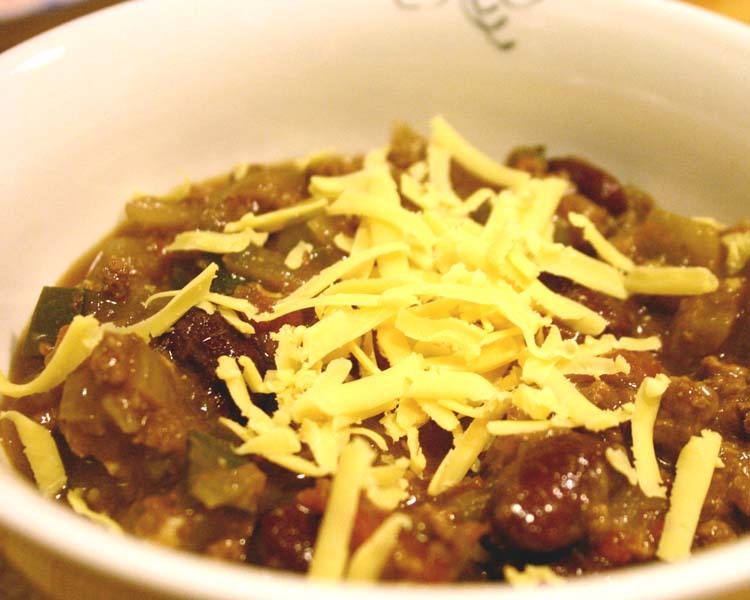 Reheat chili in the microwave or on the stove. Divide between two bowls and sprinkle with cheese. Scoop it up and enjoy! Have three pans on the stove, ready to put this dinner together. You need one pot to boil your pasta, one small saucepan to boil your egg, and one medium saute pan for the breadcrumbs. Fill a large pot with water for your pasta. Set over high heat and bring to a boil. In the meantime, fill a small saucepan with 3 inches of water and set over high heat. Bring to boil, gently add the whole eggs; boil for 5 1/2 minutes, remove, plunge into cold water and set aside until everything is done. Add pasta to the boiling water and boil for about 8 to 10 minutes or until desired consistency. While your pasta cooks, heat 1 tablespoon of olive in a saute pan over medium high heat. Add garlic and cook 30 seconds; add breadcrumbs and saute until toasted, but not burned. Remove from pan and set aside. Add fennel to the pan and warm up just until hot. Add the breadcrumbs to the warmed fennel in the pan, and remove from heat. Drain your pasta, add to the breadcrumbs mixture and toss to blend. Immediately divide between two bowls, top each with half of the herbs and half of the cheese. 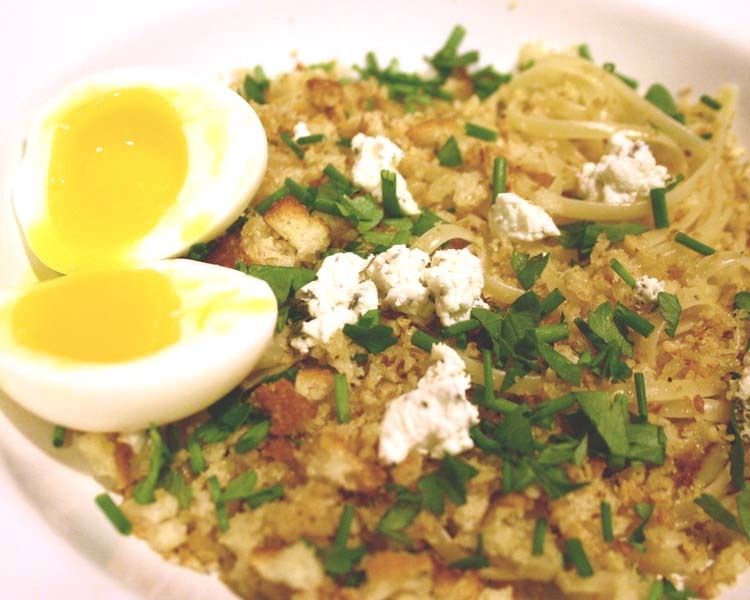 Crack and peel your eggs, cut in half and serve with the pasta. About the vodka in the sherbet…we had some Absolut Citron left over from a party, and that’s what we used. Grapefruit + buttermilk + citron vodka = some tangy stuff. 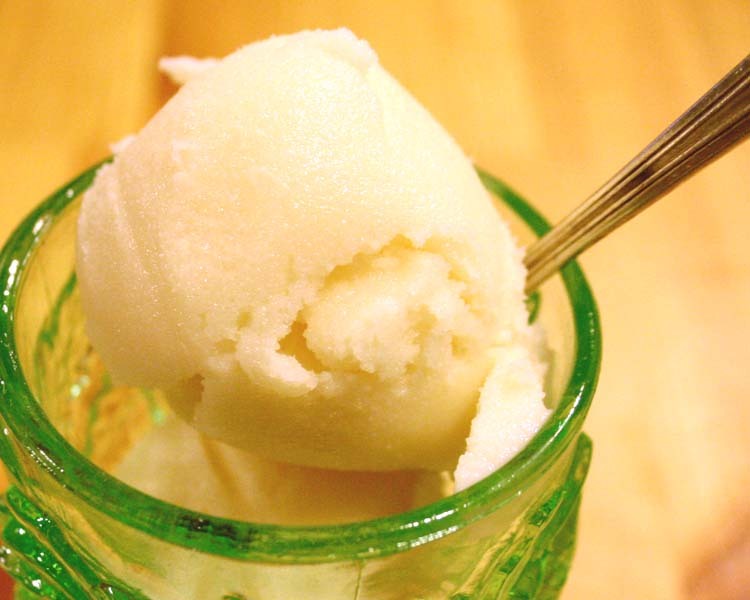 Whatever vodka you use is going to change the flavor of the sorbet, so stay away from anything with a weird flavor infusion, like something made for bloody marys…that’d be gross.